Join us for upcoming events, classes and programs at Rockaway Township Library! All events are free and open to the public. Registration required where noted. Join us for a morning movie, Ralph Breaks the Internet (rated PG), and snacks. Discuss Events in the news. Select winners of Morris Hills/Morris Knolls scholarships. Do you already know how to use Word, but want to learn how to format documents more professionally? This intermediate level class explores editing, alignment, page formatting, headers, images and tables. Different spring themed crafts will be avaible to make here or take home to decorate. Children of all ages. No sign up necessary. In Children's Room. 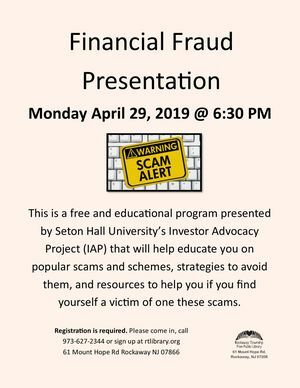 This is a free and educational program that will help educate you on popular scams and schemes, strategies to avoid them, and resources to help you if you find yourself a victim of one these scams. Registration is required. An advanced look at charts, pivot tables, and other topics.